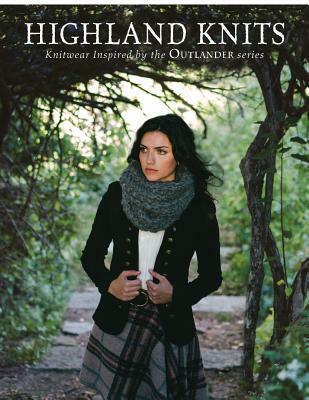 I took a breather from my Boring Sweater (as a first sweater probably should be) with a darling capelet inspired by the Outlander TV series—an entire book is dedicated to these Highland Knits. 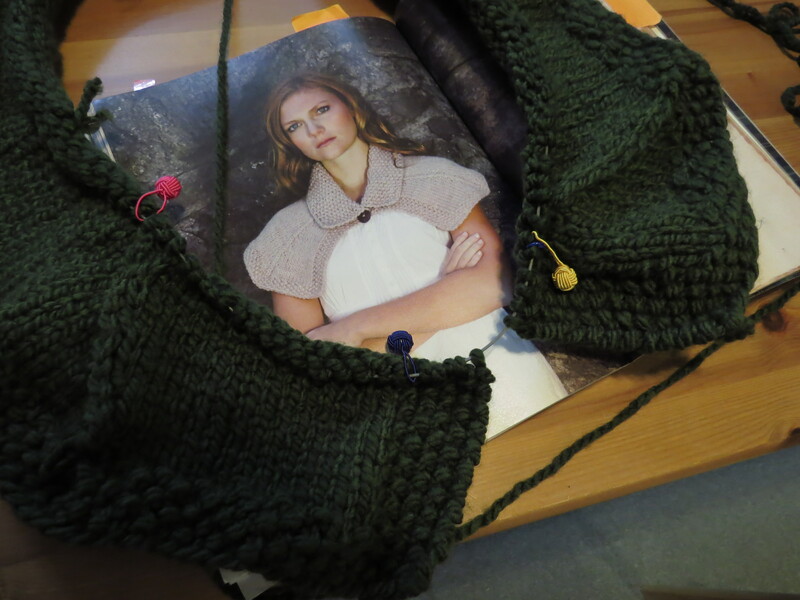 What an age we live in, that even I, disconnected from fashion and social pressures, find myself knitting a “modern” design based on a fake rendering of 1750s Scottish knitwear, worn by a fake person who herself is based on a character in a novel. Then again, my grandmother crocheted me mighty fine ponchos in the 70s, inspired by Marcia and Jan Brady. So perhaps I’m coming full circle to my real roots of following the knitting crowd. 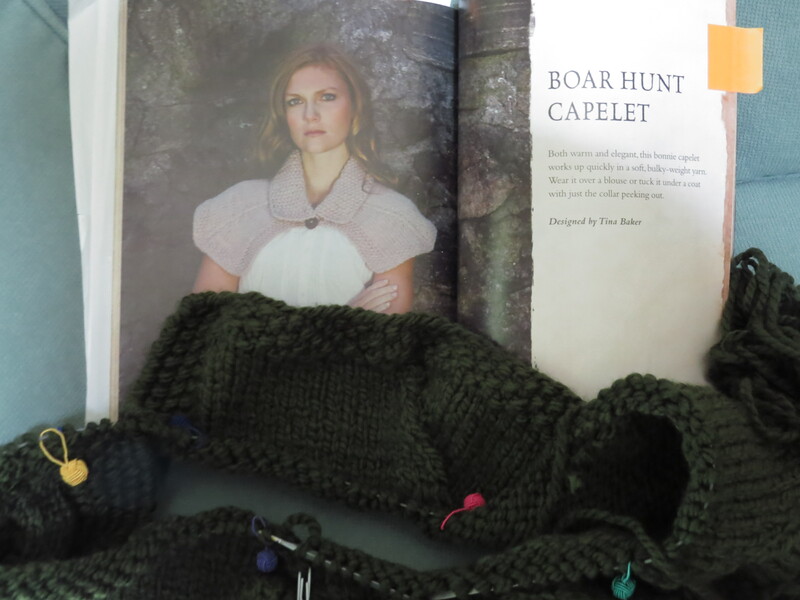 The Boar Hunt Capelet brought to mind my friend Waverly, not because she hunts boar (to my knowledge, though Seattle’s Capitol Hill can get pretty wild), but because she writes wonderful Victorian novels—somehow blending precise, relevant historical detail with modern, feminist sensibilities. While Victorian London is not exactly Scotland in 1745, what’s 100+ years’ difference when it comes to creative cowls? None of them wore underwear, so they were all a bit chilly. Since I only have approximately 13 other knitting projects going, I gave it a go. 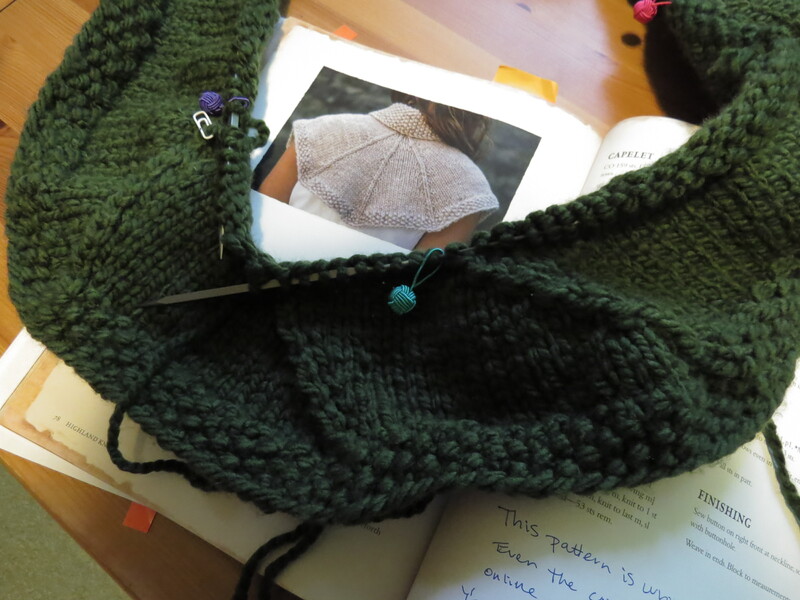 The capelet pattern delighted me after the repetitive sweater, which is knit entirely in one stitch. I want to keep learning and upping my knitting game. I keep an “easy” (if anything after 10 months of knitting can be called easy) project ready to go at all times, solely to keep me occupied and content during down times. I call it the Mindless Waiting Room Hat (so far in the waiting rooms of therapists, dentists, and eye doctors but not yet—knock on wood— police stations), though it’s also perfect for poetry readings. The capelet is simple yet challenging, and because it’s small and the yarn and needles are big, it should knit up quickly. A nice, fun break from the monotony of the Boring Sweater. A quick stitch review on stitches like M1L, M1R (not British highways but a way of increasing stitches), and S2KP (this does not mean that 2 suckers clean your kitchen), and I was ready to go. But I ran into problems on Row 2. I won’t go into it, but at 159 stitches per row, it’s a bad moment when you discover your error waaaay back on stitch 17. The unraveling and re-stitching proved frustrating. Eventually I worked through it and the fabric began sailing along by Row 3. Even when the Little Monster drops another F bomb on me and I make a mistake, it’s a straightforward fix and I’m soon humming along again. Although the night when there was nothing on the radio—listening to actual FM radio, generally an indie station which we still call by its old call letters, is our new favorite retro pastime, just to add something else to really irritate a 15-year-old, as if there isn’t already enough to annoy him—and the Man I Married suddenly decided to pop in the 4-CD Pink Floyd Collection we’ve had for a decade but never played (we can no longer remember who lent it to us) and I also decided to try the anti-nausea THC squirt (I wasn’t nauseated, but what the hell? )…let’s just say I made a few mistakes. La! They were all funny, funny mistakes! Now 22 rows and a week in, I sensed that something was terribly wrong. I kept re-reading the instructions. Had I mistaken SK2P or KP2S (whatever they are) for S2KP? Had I reversed M1R and M1L? Nope. “It looks fine to me,” the Man I Married kept saying. “It looks really good.” Sure. As if I’ll believe him ever again. But, no, I soon confirmed that the Little Monster was committing the worst imaginable crime against his mother: eating her expensive dark chocolate (which was tucked away in a super-secret location). Now you don’t have to ask why I have not yet knit him even a single scarf. I hope that chocolate went down a cold, cold gullet. But on Row 22 (that’s 3,657 stitches, not that I’m counting) I ran into a road block. A literal block, in that I did not have enough stitches left between markers to execute the pattern directions. We make every effort to ensure the accuracy of our patterns, but mistakes occasionally occur. Errata can be found at knittingdaily.com/errata. Indeed, there are errors in the pattern. I should have checked over 3,000 stitches ago! At the same moment I discovered the errors, I dropped a stitch, and I also dropped—literally, onto the floor—one of the cute markers that mark key places in the pattern. Hell and damnation, Sassenach! Frustrated enough to gut a boar myself and eat it raw just for the pleasure of shredding flesh with my teeth, I dropped the whole mess to the floor and fetched an old mini bottle of fizzy wine, instead. So much for a fun diversion from a yawner pattern. Also check the comments section: furious knitters confirmed my suspicions that there are more problems with the pattern than the ones corrected. The corrected pattern is available for purchase. Righteous indignation by women brandishing sharp metal sticks (pens or knitting needles) should not be ignored. I’m used to my mistakes, so I find myself flummoxed that I can actually blame this mess on someone else. The Little Monster is a pro at blaming others, and I admit that it is more gratifying than shouldering full responsibility. I haven’t unraveled it yet. That step is going to gut me as sure as if I were a felled boar…a hoary, whiskered, defeated bore! Part of me is still considering whether I should, as I do with so many other things in life, simply soldier on with it as best I can and live with the imperfect result. After all, the boar won’t care. The three “seams” all slant in the same direction, instead of a pretty “triangle” shape in the pattern photo. The “Errata” correction does not address this. The two front “seams” also slant in the same direction, instead of slanting in different directions, inward toward each other. So for the first time in my life, I defaced a library book to warn other knitters. 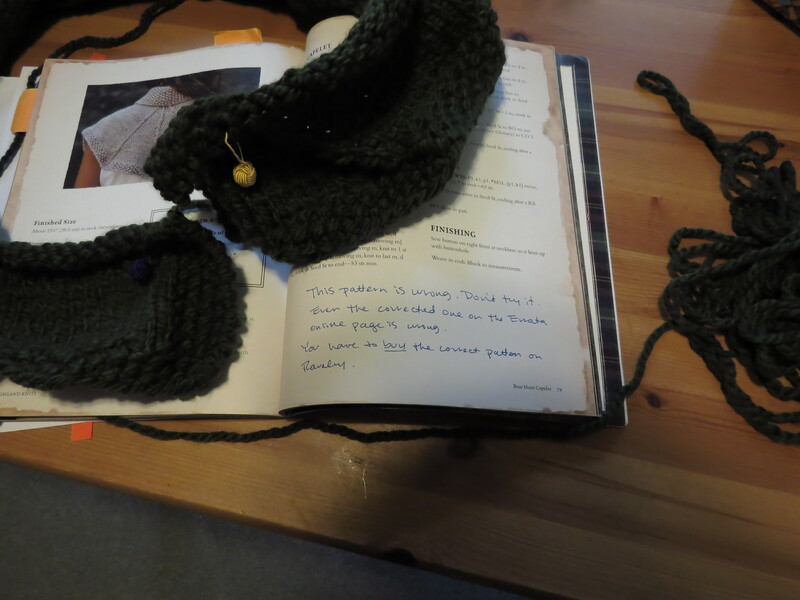 I paid for the Ravelry pattern, and it is completely different from the book pattern. 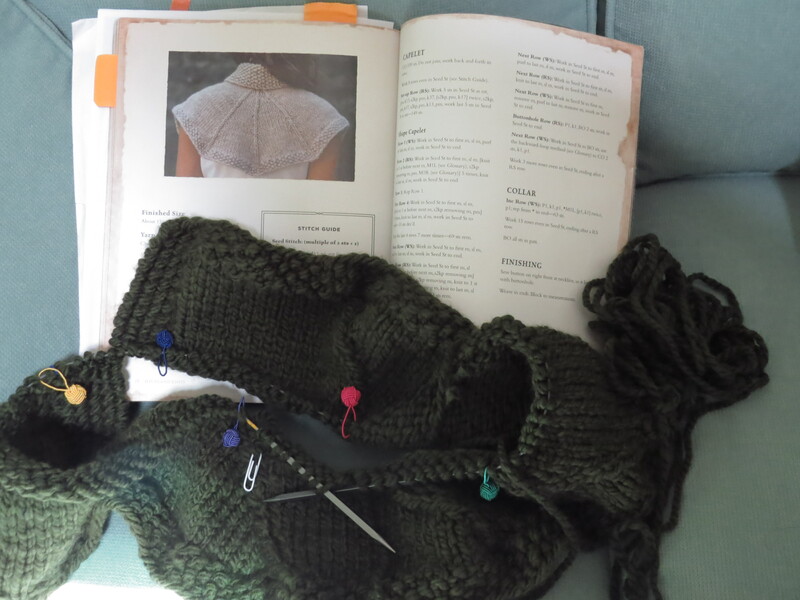 There IS a similar FREE Boar Hunt Capelet pattern on Ravelry, and I’ll be trying that one first. I have to get it right, because Mom has requested one, in a lighter-weight yarn, of course. Hilarious! I don’t knit but I can relate in other areas of my life! Indeed! Me, too! Thanks for reading.